A mixed team of years 7, 8 and 9 players came fourth in the closed play tournament at Kings Edwards Camp Hill school this year. Most of the team managed to win at least 1 out of 3 matches. However, well done to the year 7 players who all won at least 2 out of 3 of their games and especially well done to Amrit Singh who won 2.5 out of 3 and Amron Bahti who won all 3. Clearly some bright prospects for the future. The first team end their season with a win in a dramatic match against Five Ways. Initially things didn't look to be going our way with two early losses. However, Liam Conner managed to win his game and record his first win for the first team this season, closely followed by Sarvesh Rajdev marking his debut in the first team with a draw. With the scores finally balanced at 1.5 to Queen Mary's and 2.5 to Five Ways, the last 2 games were very tightly contested and nerve racking for both players and spectators. Ben Nevett Farman finally managed to break the dead lock in his game and record a win to level the scores. Fahim Nasiri's game couldn't have been closer! After around one and a half hours of play the game was still very finely balanced. Fahim, with just the slightest of a material advantages (one pawn). Eventually, Fahim managed to take advantage of this and complete the come back for the team. Well done to everyone involved. Especially well done to Fahim Nasiri for winning all of his games this season whilst playing on board one against the best players in the Birmingham Junior Chess league. There isn't a trophy for the leagues best player, but if there was he would have won it this year. Also, very well done to Ben Nevett Farman, who has won all of his games in the first team this season. Queen Mary's held a big Saturday tournament this weekend, for the first time in a long time, with teams from all over the country taking part. The tournament started at 11am consisted of 5 rounds and finished at 5pm. 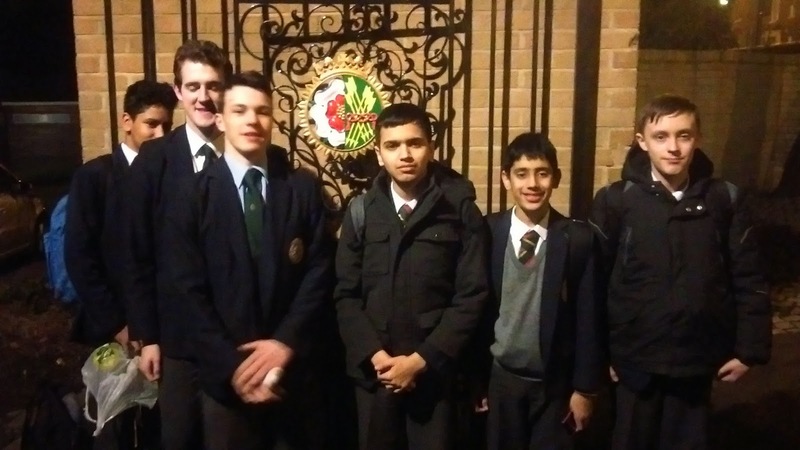 Although no Queen Mary's students managed to win a medal this time, well done to Saif-Ullan Hussain, Amaron Bhatti, Sarvesh and Liam BerenBuam for winning 3 out of 5 of their games. Also a big thank you from me, to all of the people who help me organize the event.